ALBA reported positive performance figures for Q1 in sales, output and safety and picked up an award for corporate governance while also having its chief executive named among the region’s top CEOs. Notwithstanding a downward trend in LME prices, sales reached 228,301 tonnes, an increase of 1,835 tonnes, compared with 226,472 tonnes in Q1 2014. Production jumped 2.4 per cent to 237,774 tonnes for the same period in 2014. The company closed the first quarter with its value-added sales averaging 64 per cent of total shipments versus 66 per cent in 2014. “Despite challenging market conditions, we are pleased with the higher overall figures for production and sales, ahead of the company’s own forecast for the period, thanks to strong management performance,” said chief executive Tim Murray. The company achieved a major milestone of 5 million hours without Lost Time Injury (LTI) on March 31. It last achieved this milestone in March 2008. “The new milestone demonstrates Alba’s ongoing commitment to the safety and welfare of its employees and contractors at the workplace,” a statement said. The 2015 award for Best Corporate Governance in the Middle East – Industrial Sector was granted by the Ethical Boardroom, a leading international publication on corporate governance and ethics. It recognised Alba for its role is establishing and maintaining good practices in accountability and transparency in the region, and for its efforts in promoting ethics and integrity. The award was received by Murray and chief internal auditor and risk officer Bryan Harris. Murray said the award recognised the journey Alba undertook in recent years to align its practices with the highest standards of corporate governance from around the world. Alba was one of the earliest companies in the region to launch its own confidential reporting system, and its own Code of Conduct, which outlines the ethical parameters that govern the company, sets rules in the way business is conducted, provides guidelines in interactions with customers, suppliers and other external bodies, and ensures organisational behaviour remains in line with the values of the company. Alba was recognised for its outstanding environmental achievements and sustainable practices when it was declared a winner of the Green Era Award for 2015. The award is granted by the French Otherways Association to companies that have made sustainability a key driver in their business strategy. Murray said the prize affirmed Alba’s commitment to best environmental practices and recognised its on-going commitment to making a positive impact on the environment and on society at large. Murray and the senior manager for safety, health and environment, Abdulla Yaqoob Senan, were presented with a certificate and trophy at a ceremony held in Berlin, Germany. Murray was named as one of the top 100 CEOs in the Gulf Cooperation Council (GCC) at the Top CEO Awards held recently in Dubai. He was also amongst a group of Top 5 CEOs in Bahrain, which included Batelco Group’s former CEO Alan Whelan, Bahrain Islamic Bank CEO Mohammed Ebrahim, Al Salam Bank CEO (and an Alba board director) Yousif Abdulla Taqi and United Gulf Bank CEO Rabih Sokaireh. The Top CEO Awards – organised by Trends magazine and Insead Business School, in association with Hawkama, the regional institute for corporate governance – honour the very best in GCC business leadership. It recognises top executives for being instrumental in the growth of GCC companies, as well as for creating jobs, maintaining profitability for their shareholders, applying corporate governance and transforming” the region. Murray has been instrumental in changing the safety culture of Alba and in initiating a Six Sigma culture, improving Alba’s approach to sustainability and cost-effectiveness, expanding the company’s supply chain, driving value-added sale and adopting a new marketing approach for Alba. The company held a strategic offsite meeting titled ‘Preparing for Change Management’ for all executive management at Alba Club with the aim of strengthening the company’s competitive edge. 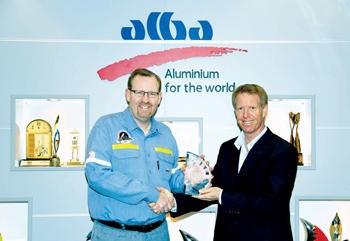 Part of Alba’s Executive Education series, it was led by chief executive Murray and focused on the challenges facing the aluminium industry and how Alba was aligning its priorities to achieve its objectives. 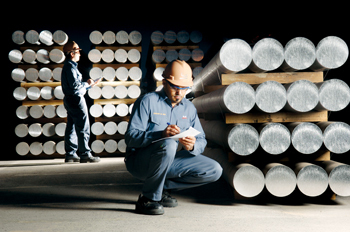 “Alba and the aluminium industry are facing very challenging times with falling prices and rising input costs. The world is rapidly changing and we must change faster if we want to maintain our position as a leader in the industry. The meeting gave us an opportunity to align our objectives and plan for the necessary changes to stay competitive,” said Murray.